Certified by Sira under directive 94/9/EC (ATEX) for Group II, Category 2, G and D, the enclosure provides a large measure of flexibility based on Power Dissipation and is suitable for Zone 1, 2 (Gases) Zone 21 and 22 (Dusts). The product is supplied with 4 x M20 entries (2 x plugged) and 6 x SAK 2.5 terminals and 2 x EK2.5 Earth terminals as standard. Different variations of Terminals and entries are available upon request. Material Standard: Glass Reinforced Polyester, Flame Retardant. Or Fortron PPS for 130°C ambient, when fitted with ceramic terminals. Cable Entries: Standard entries are 20mm and 25mm ISO metric, 1.5mm pitch. Alternative entries are available upon request. NPT ½” and ¾”. Pg 11, 13.5, 16 and 21. BS conduit ¾” and 1″or plain clearance holes. Terminal Blocks: Various terminal blocks may be fitted to the enclosure see the table for the approved types and formulae for calculating the loading for specific applications. 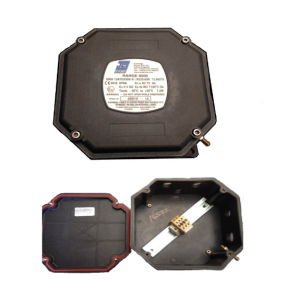 RANGE 9500 is an Explosion Protected/Weatherproof/Junction Box which is Sira certified under directive 94/9/EC (ATEX) for Group II,Category 2, G and D. The enclosure has been certified to give a large measure of flexibility based on Power Dissipation and is suitable for Zone 1, 2 (Gases) Zone 21 and 22 (Dusts). Cover Screws: Stainless Steel captive. Cable Entries: Standard entries are 20mm and 25mm ISO metric, 1.5mm pitch. Alternative entries are available upon request. NPT ½” and ¾”. Pg 11, 13.5, 16 and 21. BS conduit ¾” and 1″ or plain clearance holes.